← From Nate to Dr Horrible in about an hour. 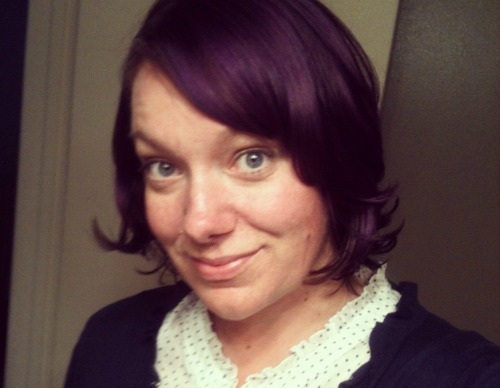 In June 2012 I dyed my hair all funky with loads of purple. This was the image that inspired it, my hair has a ring of dark underneath as well, it’s just not as visible. It helps break up the bangs a bit with some darker strands and also helps when roots start growing in. Image shamelessly stolen from somewhere during a Google search. I apologize. I took my purple hair to school on the very last day and was asking if it was a wig, some kids tugged on it but overall it was pretty fun and no one seemed to mind. I had an appointment for the end of August to have it put back ‘to normal’ but as the summer went on I really liked it. Crazy funky hair is a bit tricky, espeically if you pay for it at the salon. 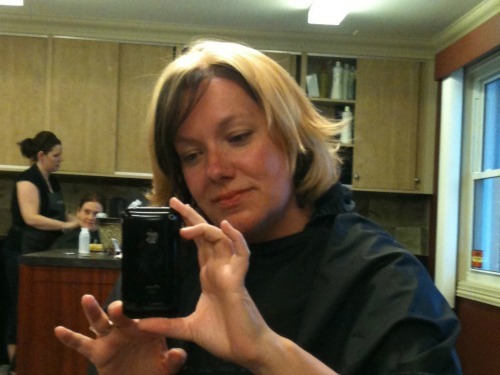 The bleaching and colour and all that was $140. 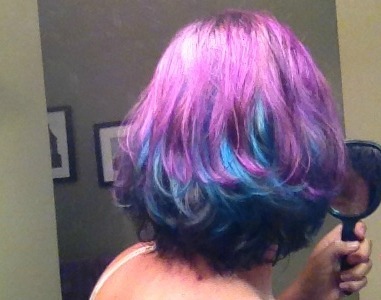 I touched it up here and there myself with Splat, their shade of purple matched better than Manic Panic‘s did. I’ve also been to the salon for the whole root touch up bleaching thing again. Unless you do it all at home yourself funky hair can get pretty expensive. If you’re going to live a little and try it all at home Kaylah and Elycia are the experts. So this summer I let my hair just go a bit, I didn’t baby it. In a backyard pool I dunked under and swam across, at public swimming I let the kids splash me, I didn’t wear a hat, I went out in the sun . . .basically I enjoyed summer! My purple faded to a truly outrageous pink. Since I have an appt at the end of August at the salon I took the opportunity to play a bit. I picked up some Atomic Turqoise and had some fun. It took 3 tries, I wasn’t pulling up enough hair for the blue ring at the front. 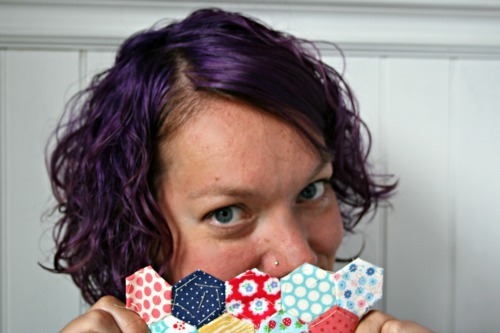 I was being hesitant and dind’t want to mess up my purple entirely. 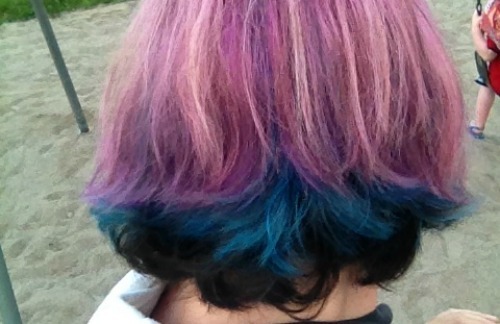 Once the blue was nice and deep and as good as I was going to get it I realised just how faded the purple was. So for $14.99 I fixed it too. It’s fun wavy or curly but it works best straightened I think. It’s hard to catch in a picture that I’m taking myself but hey there it is. So I’m living a little before the 31st when I do . . . something else to my hair. I still haven’t decided but I’m getting and gathering ideas here. 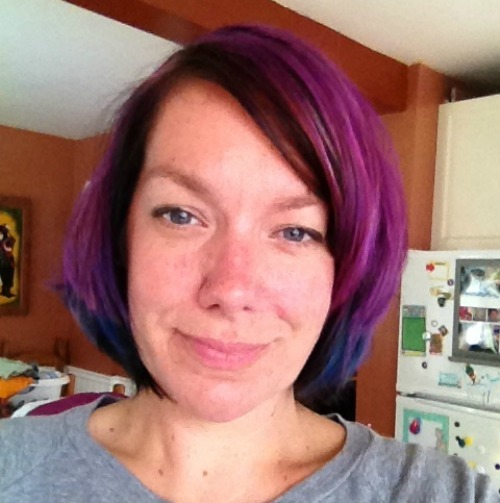 This entry was posted in DIY and tagged aqua, atomic turqoise, blue, dlying, hair, lusty lavender, manic panic, purple, splat. Bookmark the permalink. 5 Responses to My hair journey. I think you’d look great in red with some dark highlights. Virna, I’m probably going with dark and bright red. I’ll have to post pics once I’m done.